Making a CGI movie without being Pixar, Lucasfilm or other big studio is a risky attemp, but the world of Warhammer 40.000 is not so mainstream as to allow Games Workshop to spend so much money. 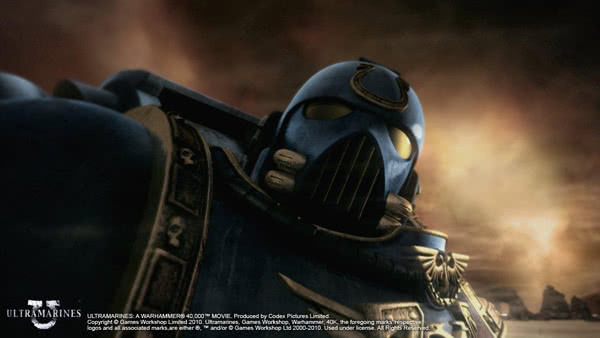 Ultramarines: The Movie is the first official full-length animation movie about the grim future. Around 70 minutes of action, depicting a Ultramarines ship responding to a distress signal from a beacon on a planet, from other chapter of Space Marines who have fell to a Chaos attack. The best ace of the movie is the background/setting: Fully respects the boardgame, the weapons, the decoration, the courage and no fear attitude of the space marines... It is glad to see everything depicted correctly, from the armor details and purity seals, to the big bolters, thunderhawks, land speeder, futuristic gothic buildings... Everything is as in the books, illustrations and miniatures. The story feels short but enough to keep some tension during the 70 minutes, with all the space marine chicles, taunts and war quotes. The sound is pretty nice too. As I'm used to play all existing Warhammer 40.000 videogames, the weapons sound the same, voice acting is good, and the music has some great tracks (gothic chants with motivating music). And then we come to the visuals/graphics. They are in the middle, not bad not impressive, with varying quality depending on the scene. The faces are in general very well done, every 3D model is an accurate representation of the "real" one and some lighting and fire effects are very good. But in general, it could have been better. If you've played the PC game Dawn of War II for example, its introduction movie has more quality. The marines sometimes move a bit too fast (don't forget they're carrying a huge armor and big guns), and while it's for sure very hard to animate them, the games have a more natural movement than this movie. Also, some scenes have lower quality than the rest, with not too good lighting (so the marines are too bright) or lower resolution scenarios (sometimes they look really poor and lacking detail). My final complaint could be that, probably to stay in the budget limits, the enemies are chaos, yes, but still space marines. Of all the so visually varied races, choosing them reduces the visual variety. Orks are the always-present first choice, but with the Ultramarines the Tyranids would have been more appropiate. This is a matter of taste and not a bad point itself, but let's hope there would be more movies in the future with other races. I liked the movie, is not perfect but I hope it starts a new line of long-term products with more movies, whenever they are based on the long list of Warhammer 40.000 novels or smaller stories like this one. If you are a fan of the game you will probably enjoy the movie.